In efforts to specify bivariate probability models the researcher is frequently hindered by an inability to visualize the implications of assuming that a given bivariate family of densities will contain a member which will adequately describe the given phenomenon. We contend that it is often easier to visualize conditional densities or features of conditional densities than marginal or joint densities. Thus, to cite a classical example, it is not unreasonable to visualize that in some human population, the distribution of heights for a given weight will be unimodal with the mode of the conditional distribution varying monotonically with weight. Similarly, we may visualize a unimodal distribution of weights for a given height, this time with the mode varying monotonically with the height. It is not as easy to visualize features of the appropriate joint distribution unless we blindly follow Galton’s assertion that a unimodal bivariate distribution with elliptical contours is clearly appropriate. Actually, for some of Galton’s data sets, the elliptical nature of the contours is far from self evident. The point is that, even for the height-weight data, an assumption of normality for both sets of conditional distributions might be the most we could justify. As we shall see, such normal conditionals distributions comprise a flexible family which subsumes and extends the classical bivariate normal model. 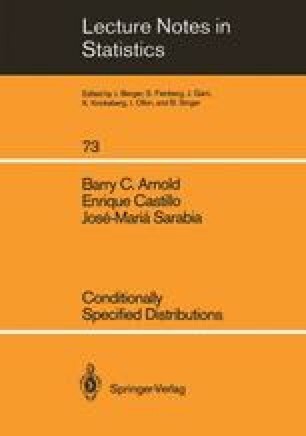 The focus of this monograph is the study of general classes of conditionally specified distributions. In addition, to distributional properties we will provide necessary information on estimation and simulation for such models. Before embarking on this study, we will make a few brief comments on alternative methods of specifying joint distributions. In addition we will trace a few historical precedents for the study of conditionally specified distributions.